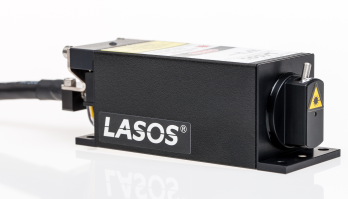 The LASOS DPSS lasers (Diode Pumped Solid State Laser) series is the best choice when reliability and long lifetime matters. These characteristics within our wide range of wavelenghts from 320 to 640 nm are ideal for a variety of applications as in DNA sequency, flow cytometry, digital imaging, analytical chemistry, fast flow rate particle measurements or confocal microscopy. Since all laser models emit only a single longitudinal mode they are also an ideal choise for application in RAMAN Spectroscopy, especially the wavelengths 473, 515 and 532 nm. Housed in compact and robust packages, these lasers are the perfect choice for design in and integration into OEM instrumentation and systems and also for end user applications in research and development. The lasers will be provided as selfcontained laser modules, as OEM-component modules or as fully integratable subsystems with a compact controller as OEM or stand alone version with computer interfacing. Customized solutions for specific applications are possible. All laser models can be provided with a polarization maintaining, adjustment free fiber coupling.